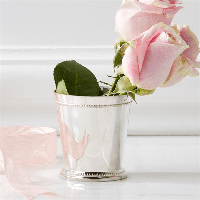 Inspired by the Kentucky Mint Julep Cup, our small McKenzie Mint Julep Cup Vase instantly elevates your florals with our lovely vintage silver Mint Julep Cup Vase. Featuring a beaded rim and base, our Mint Julep Cup Vase is food safe, made from heavy, lacquered silver plated brass and adhere to the traditional design down to the last detail. 2 3/4" H x 2 1/4" Dia.